I. Brachythecium. Brachythecium is a fairly easy genus to recognize, although the species can be annoyingly difficult to separate with confidence. 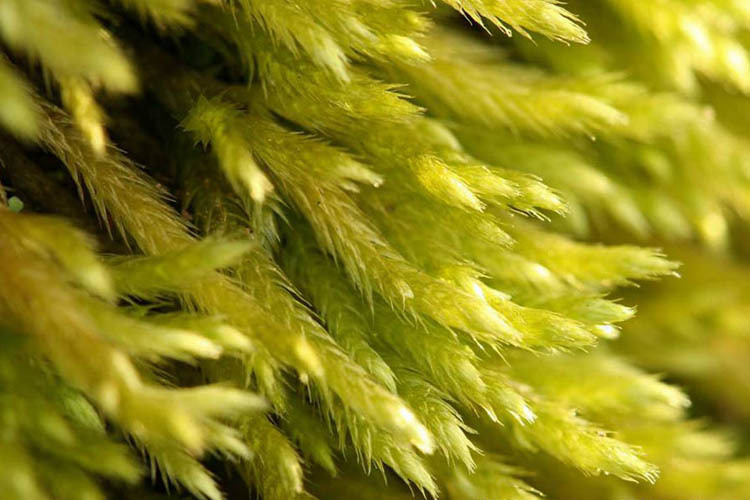 Look for bright yellow-green carpet mosses. Brachythecium is a light yellow-green pleurocarp. Through the scope, see leaves that are costate (i.e., possessing a costa, or mid-vein) and that are, in many instances, somewhat pleated (folded slightly) in the long direction on either side of the costa. 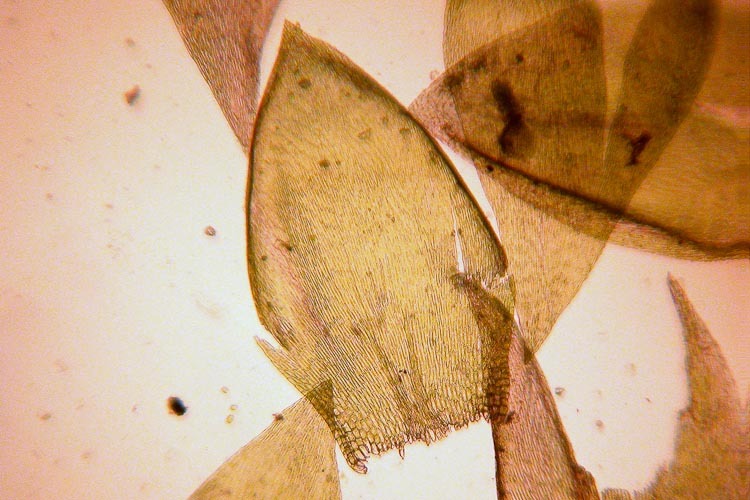 Brachythecium leaves are toothed, costate, and plicate (folded lengthwise). II. Amblystegium. 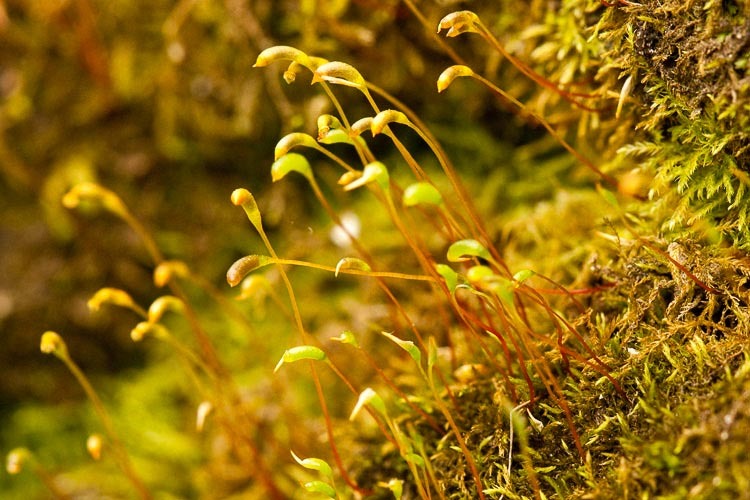 When “in fruit” (producing sporophytes, which of course are not fruits), members of the genus Amblystegium can often be recognized by the remarkable size disparity between the two life stages: smallish gametophytes, and strikingly tall and abundant sporophytes towering way above the gametophytes. 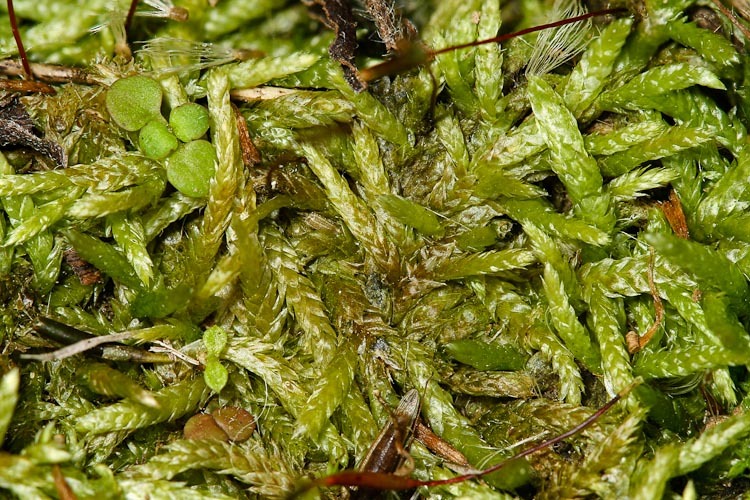 Amblystegium: small gametophytes with abundant and quite tall sporophytes. 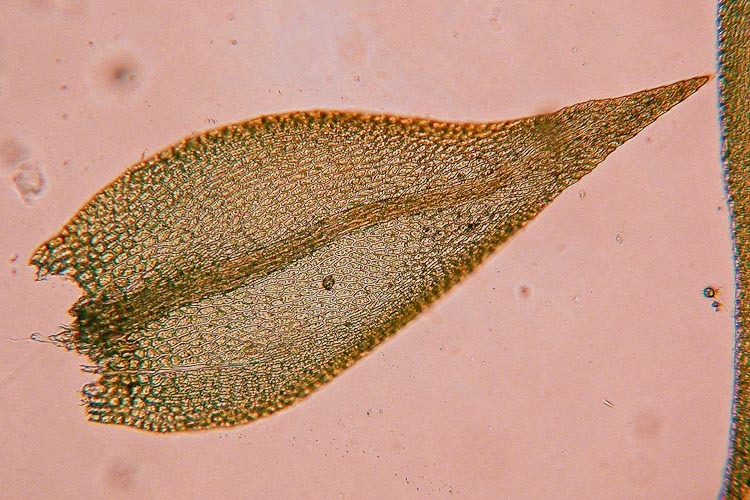 Microscopically, most members of the genus are marked by cells that are generally quite short. A costa is present, the length of which is the principal means to tell apart the most common species. Amblystegium leaves are costate, with short leaf cells. III. Entodon. Entodon is a medium-sized pleurocarp that grows in very shiny green mats on logs.It’s very shiny. It shines. Did I mention the shininess of Entodon? Redrum. Gaaah. It’s hard to look at; it’s so SHINY! 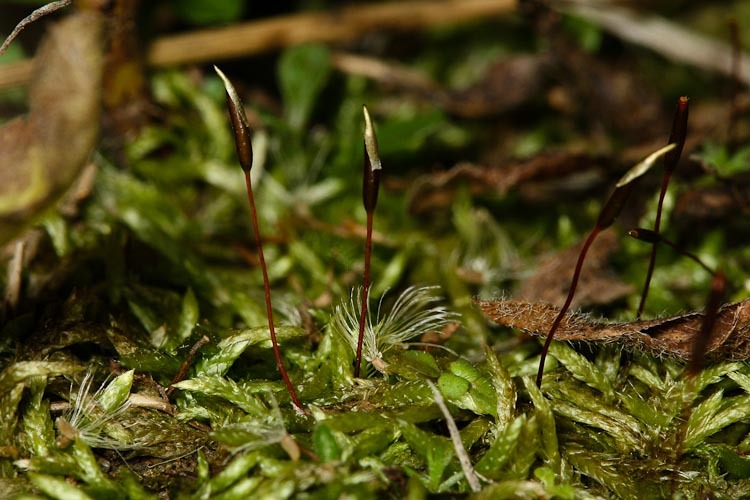 The sporophytes of Entodon are erect, not curved in any way. Entodon sporophytes are erect, with straight capsules. Oooh look; here’s an itsy-bitsy spider that went up the sporo-spout. 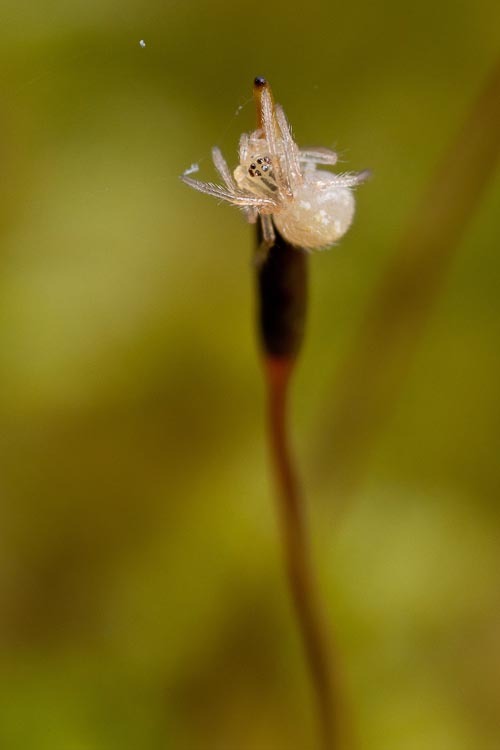 Small spider atop Entodon capsule. There’s actually a video of that on you-tube. Amazing the things some people think you’ll find interesting. 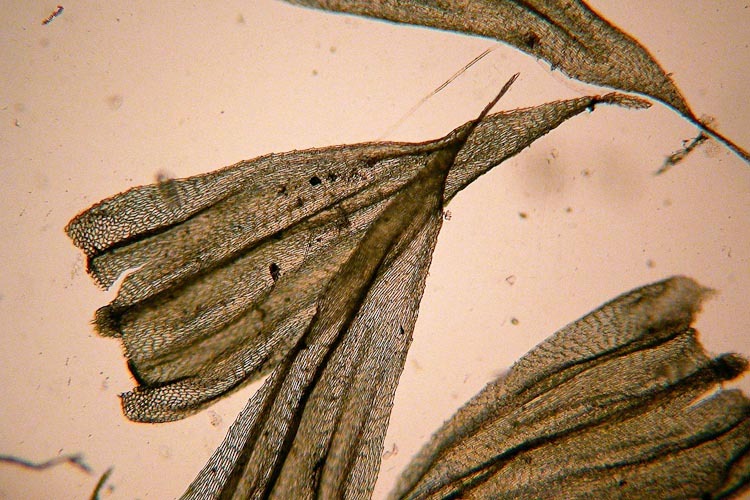 Through the microscope, Entodon leaves are distinctive: very symmetric, with a short double costa. Occasionally when examining mosses through a microscope, you’ll see a little critter such as this tardigrade, also known as a “water bear.” This short video features narration by a tardigrade scientist with a calm and measured demeanor.